Above Left: Notre Dame at Christmas, 2016. Above Right: Nôtre Dame at Christmas via David Coggins in Paris in Winter, 2005. With so many cities around the world to visit, the destination of our family’s annual four-day urban holiday is always up for discussion. This year I managed to successfully negotiate that we go to Paris during the week between Christmas and New Year’s. 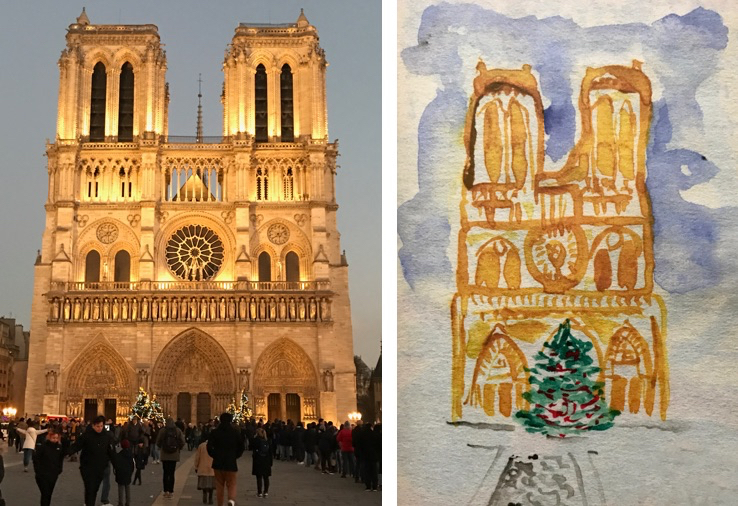 Having heard many times that Paris was beautiful at this time of year — yes, even more than it usually is — I wanted to confirm the city’s claim in person. When the boys were younger, we often hired guides to help us put the magnificent art and architecture of the cities we were visiting into a context that they found relevant. Now that they’re both in university, we turn to each other and Google. And I am free to seek a different sort of guide — one that can bestow the essence or flavour of life in that city, both in the past and now. Sometimes the seeking can take awhile before I find that right book, movie, poem, painting or a combination of all of the above. With Paris, I got lucky. 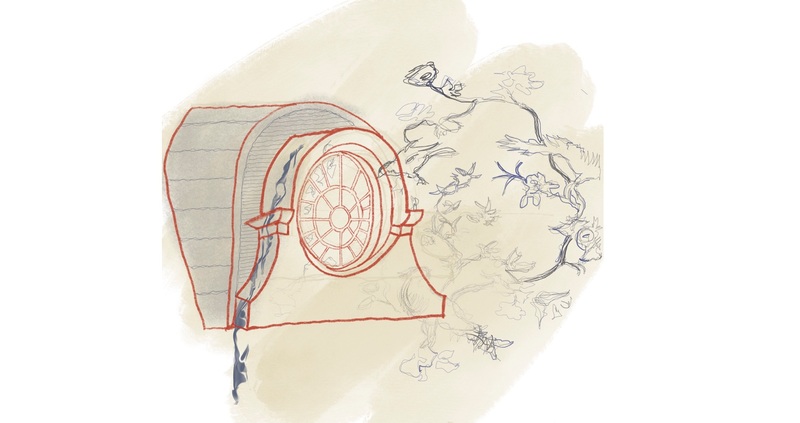 Last year, a friend recommended a travel memoir, Paris in Winter, by the Minneapolis-based artist and writer David Coggins. 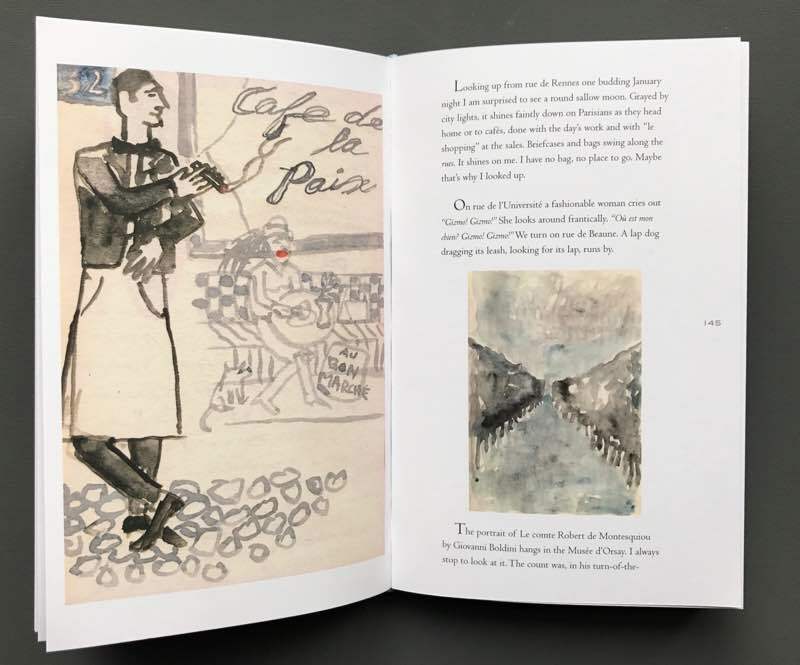 Over the twenty years that he and his family return to Paris every winter, Coggins captures his memories with eloquent words and light-hearted drawings. Above: My favourite pages of Paris in Winter by David Coggins. I read his words and wonder at his drawings while trying in futility to assimilate his family’s twenty years into our four days. Above: A father and daughter share a quiet moment with Monet. Above L: “Le Bassin aux nymphéas harmonie rose” by Monet. Above R: “Le Bassin aux nymphéas harmonie verte” by Monet. On Day 3 we brave the queues we have been avoiding and go to the Musée D’Orsay. 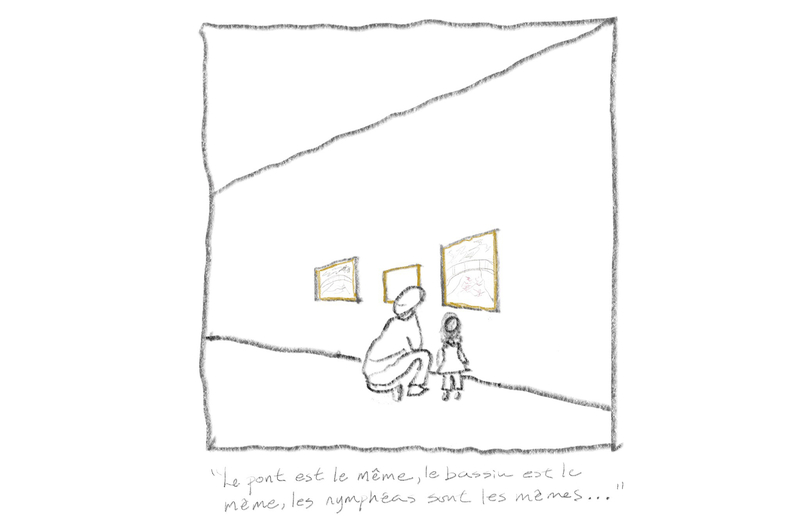 In the Impressionist Gallery on the top floor, I find myself standing next to a little French girl of about 6 years of age and her father . We are in front of Monet’s “Waterlily pond, green harmony” and one painting over is Monet’s “Waterlily pond, red harmony”. The father is crouched beside his daughter and whispering in her ear. Slowly and deliberately as if he were telling a story, he says — en Français — while pointing at the two paintings, “The bridge is the same. The pond is the same. The waterlilies are the same.” He pauses and then continues, “But look it’s the colours that are different because Monet was painting the seasons.” He then kisses the top of his daughter’s head. She looks up at her father with large soulful grey eyes in tacit understanding. Then turning back to the painting, she captures its image by snapping a photograph of it with the purple plastic camera that is hanging around her neck. The father and I smile at each other as she takes his hand and they walk over to another a painting. I’m envious about how she will forever hear her father’s words whispered slowly in her ear when she looks at these paintings. I want to follow them and hear more. A few moments later, I rejoin my family and I relay the scene I have just witnessed with the cute little girl and her poetic father. “Well yes, that’s pretty obvious from just looking at the paintings,” they say. “Why is that so exciting?” I pause to think and can only conclude that it’s because for a brief moment in understanding that little bit of spoken French in reference to two beautiful paintings in a museum in Paris, I was sharing Paris in Winter with David Coggins. Above: A sketch of Le Palais Royal from our hotel room. N.B. : This post was first published on 13 January, 2017 on “My Contents Have Shifted”.